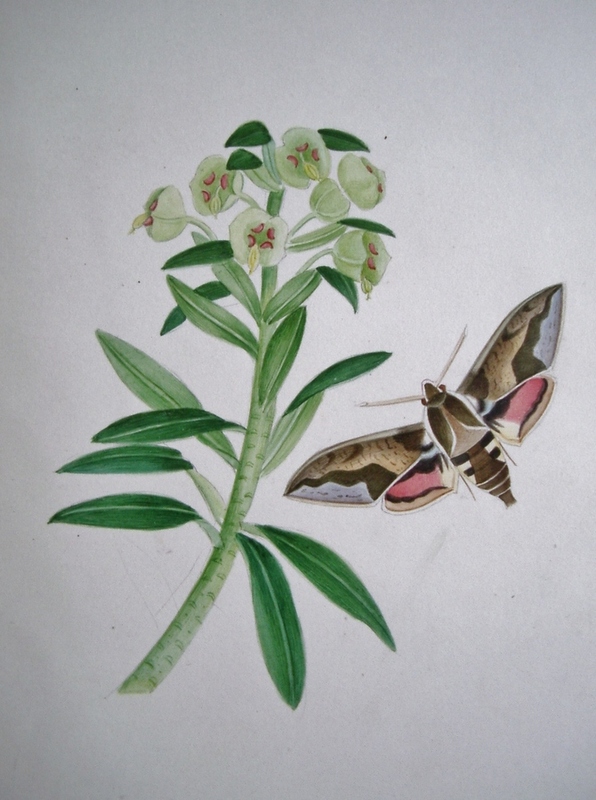 ILLUSTRATIONS OF BRITISH HAWK MOTHS, AND THEIR LARVAE, (Including the Sesidae.) With Thirty-Six Original Drawings by the Author from Specimens in His Cabinet. A very good copy of a rare and beautiful book by one of the most idiosyncratic natural history publishers of the nineteenth century, where the plates are fine original illustrations, by the author and publisher Theophilus Johnson. 1874-. Small 4to 170 x 229mm [leaf size 160 x 220mm]; 36 fine original watercolour drawings on card; pp. [4 - blanks], 4, -46 pages of letterpress text [but paginated to the printed side of the leaf only], original brown-coated end-papers. 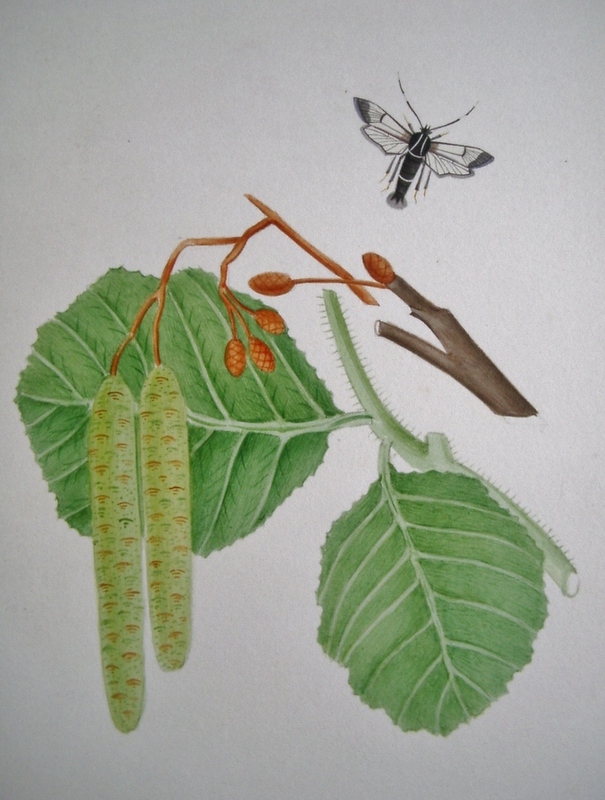 Each plate depicts a different hawkmoth species along with its foodplant, with additional plates for the larger moths showing the larva and pupa. Contemporary pebbled green cloth binding with the binder's ticket to the rear end paper "Bound by H. Pearman, Printer and Bookseller, 62 High Street, DARTFORD." Signed in pencil "Theod Johnson" to the verso of the front free end-paper - possibly the author's copy (see notes). The contents are remarkably clean with minimal marking. Binding very good with a couple of inconspicuous repairs to the joints; internal stitching remains strong, but a number of the pages have opened up where the binding glue has failed, and while this could easily be repaired, we have not done so as it allows the plates to open flat. A very good copy. [Bibligraphic Notes: Theophilus Johnson was born in Tottenham in 1836 and trained to be a letterpress printer. He lived most of this life near London Zoo and moved to Dartford Heath in Kent at the turn of the century and died there in 1919. His output as a naturalist, artist and publisher was immense, though many of his works remain obscure and are little known. Some were specifically commissioned and consequently just a single copy may have been produced. All his works are illustrated with original watercolour paintings; a prodigious achievement, which ensured that every copy published was unique. 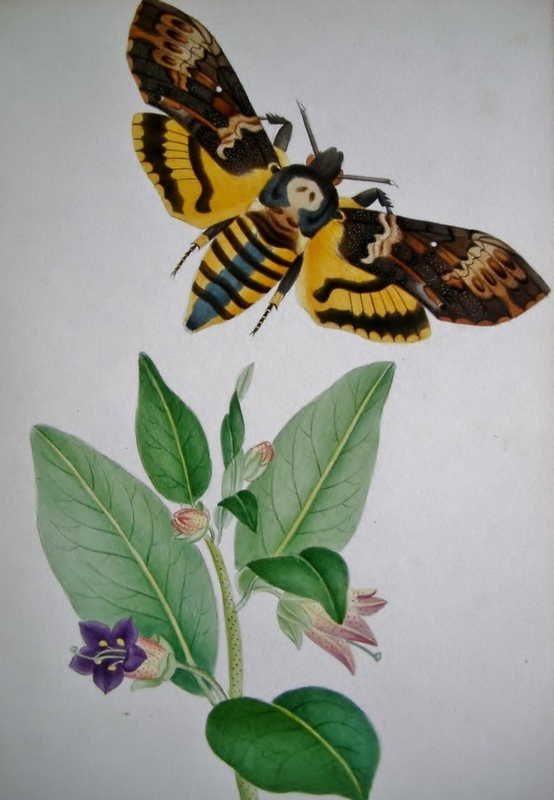 It would seem that his earlier works were generally painted to a higher standard than his later works, though copies of the same work vary in quality and certainly in specification; for instance in the current work plates 3 and 4 are on separate leaves but copies exist with these two plates on one leaf; the position of the Death's Head Hawk Moth on plate VI varies - either facing left or right; and so on. David Dunbar writes "Johnson produced a confusing range of titles which often covered broadly the same ground�He had a habit of using precisely the same printed text in similar publications produced up to thirty years later. 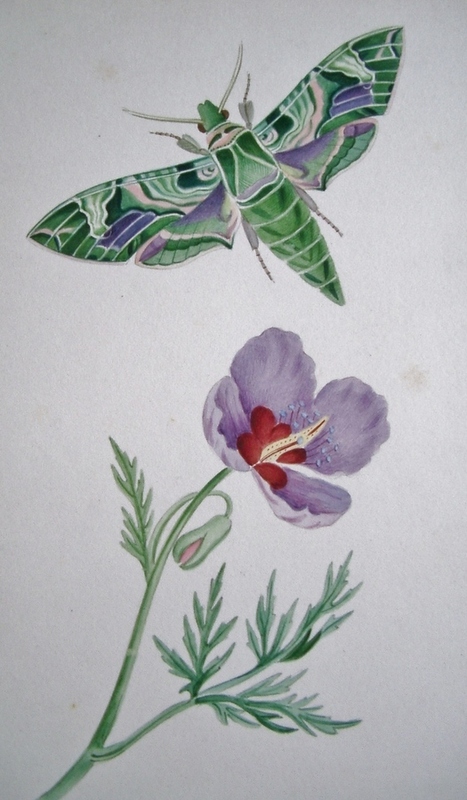 He also varied the number of plates, and the ways species were illustrated in individual copies of the same work, changing the position or number of figures shown and even the caterpillar food plants." It would seem that the existing work was published with variant titles - some including the words "with the plants on which they feed"; auction records also point to a The quality of the painting in our copy is outstandingly good with plate X featuring particularly delicate pencil work. A copy, offered in Wheldon & Wesley's catalogue No. 132 in 1975, included a cutting from a previous bookseller's catalogue that stated "only 25 copies executed" though this remains unverified. References: Radclyffe, Howard. 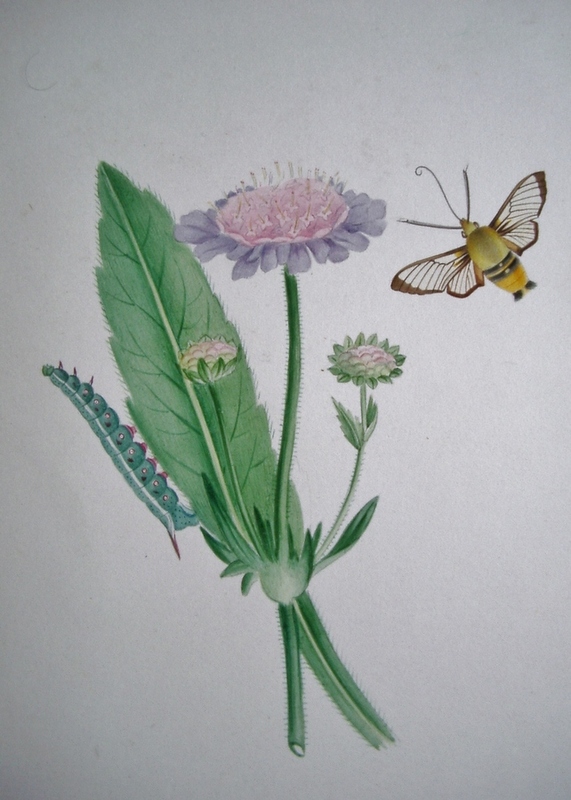 Theophilus Johnson: amateur naturalist, artist and publisher extraordinaire. Archives of Natural History (1995) 22 (20): 183-190. // Dunbar, David. British Butterflies A history in books. The British Library, 2010.